José D. Fernández (July 31, 1992 – September 25, 2016) was a Cuban-born American professional baseball pitcher. He played in Major League Baseball (MLB) for the Miami Marlins from 2013 until his death in 2016. Fernández was born in Santa Clara, Cuba. He made three unsuccessful attempts at defecting before he was successful in 2008. He enrolled at Braulio Alonso High School in Tampa, Florida, and was selected by the Marlins in the first round of the 2011 MLB draft. Fernández made his MLB debut with the Marlins on April 7, 2013. He was named to the 2013 MLB All-Star Game and won the National League (NL) Rookie of the Month Award in July and August. After the season, he won the NL Rookie of the Year Award and finished third in Cy Young Award balloting. He underwent "Tommy John" surgery during the 2014 season, and made the MLB All-Star Game again in 2016. Fernández died in a boating accident off Miami Beach on September 25, 2016. The Marlins announced that they will retire his uniform number to honor him. José Fernández grew up in Santa Clara, Cuba. There, he lived on the same street as, and was friends with, future Major League Baseball (MLB) shortstop Aledmys Díaz. They played for the same youth baseball team, and Díaz's father and uncle encouraged Fernández's mother to bring him to the ballpark. Fernández commented that had Díaz's uncle not been an influence early in his life, he would not have pursued a professional baseball career. Ramón Jiménez, Fernández's stepfather, defected from Cuba in 2005, settling in Tampa, Florida. Fernández attempted to defect unsuccessfully three times, with each failed defection attempt followed by a prison term. Fernández, along with his mother and sister, defected in 2007. On that successful attempt, José's mother fell overboard when the boat hit turbulent waters, and José had to dive into the water to save her life. They reached Mexico, and then moved to Tampa in 2008. Knowing Orlando Chinea, a coach who had trained some of Cuba's top pitchers before he defected from Cuba, lived in the area, Jiménez had his son train with Chinea. He attended Braulio Alonso High School in Tampa, Florida. Playing on the high school baseball team, Fernández was part of the Florida Class 6A state champions in his sophomore and senior seasons. Before his senior year in 2011, the Florida High School Athletic Association ruled that Fernández was ineligible, as he entered the ninth grade while in Cuba in 2006 and had therefore exhausted his eligibility. MLB's Cincinnati Reds were prepared to sign Fernández as an international free agent to a $1.3 million signing bonus. Fernández won an appeal and was declared eligible for his senior year, ending Cincinnati's pursuit. As a senior, Fernández pitched to a 13–1 win–loss record with a 2.35 earned run average (ERA) and 134 strikeouts. He also threw two no-hitters. The Florida Marlins selected Fernández in the first round, with the 14th overall selection, of the 2011 MLB draft. Fernández signed with the Marlins, receiving a $2 million signing bonus. After he signed with the Marlins, he made one start for the Gulf Coast Marlins of the Rookie-level Gulf Coast League and one start for the Jamestown Jammers of the Class A-Short Season New York–Penn League. Pitching for the Greensboro Grasshoppers of the Class A South Atlantic League (SAL) to start the 2012 season, Fernández threw the first six innings of a combined no-hitter. He was twice named the SAL pitcher of the week. Fernández was named to appear in the 2012 All-Star Futures Game. After pitching to a 7–0 win-loss record and a 1.59 ERA in 14 games for Greensboro, the Marlins promoted Fernández to the Jupiter Hammerheads of the Class A-Advanced Florida State League. He finished the 2012 season with a 14–1 win-loss record, a 1.75 ERA, and 158 strikeouts in 134 innings pitched at Greensboro and Jupiter. He was named the Marlins' Minor League Pitcher of the Year. Prior to the 2013 season, Baseball America ranked Fernández as the Marlins' best prospect and the fifth best prospect in all of baseball. The Marlins invited Fernández to spring training but sent him to minor league camp before the season began. However, they chose to add Fernández to their 25-man Opening Day roster, due in part to injuries to Nathan Eovaldi and Henderson Álvarez. Also, Marlins owner Jeffrey Loria hoped that promoting Fernández would buy him goodwill with the fans, following a fire sale the previous offseason. He was planned to be limited to approximately 150 to 170 innings during the 2013 season in order to protect his development. He was the second youngest National League player that season, older only than the Nationals' Bryce Harper. The Marlins scheduled his major league debut on April 7 against the New York Mets. In his MLB debut, Fernández pitched five innings, allowing one run on three hits with eight strikeouts. He became the seventh pitcher under the age of 21 to record at least eight strikeouts in his MLB debut since 1916. He impressed in his second start. Despite a rough outing against the Tampa Bay Rays on May 27, Rays' manager Joe Maddon took to Twitter soon after watching Fernández pitch, saying, "José Fernández might be the best young pitcher I've ever seen, at that age. I believe he will go far." On July 6, 2013, Fernández was selected to represent the Miami Marlins for the National League All Star team. He pitched a perfect 6th inning in the 2013 All-Star Game in which he struck out Dustin Pedroia, induced Miguel Cabrera to pop up for a flyout and struck Chris Davis out. With this performance, Fernández is one of only three pitchers in the history of the All-Star Game who struck out two batters prior to their 21st birthday for their All-Star debut, the other two being Dwight Gooden and Bob Feller. Against the Pittsburgh Pirates on July 28, Fernández recorded 13 strikeouts, earning the 3–2 victory. With Fernández's 14-strikeout performance against the Cleveland Indians on August 3, 2013, he became just the sixth pitcher since 2000 to strike out 13 or more batters in consecutive games. He established the Marlins' rookie record for most strikeouts in one game. For his performance in July 2013, Fernández was named the Rookie of the Month for the National League, leading all qualified rookie pitchers in ERA. He followed up his July by compiling a 1.15 ERA with 49 strikeouts in 39 innings pitched in August, which resulted him in receiving a second consecutive Rookie of the Month Award. Fernández's rookie season has been considered historic as his 4.2 Wins Above Replacement places him in the Top 10 player seasons among those under 21 years old since 1900. Fernández's Adjusted ERA+ of 174 on the season also places him in the Top 10 all-time for pitchers under the age of 21, and he is only the fourth pitcher to record this feat in the past 100 years. His strikeout rate is the highest in his league, pacing the National League at 9.81 strikeouts per nine innings. At the time after his last start of his rookie season, Fernández was in the top 10 of many pitching statistics in the National League, including sixth in strikeouts (187), first in strikeouts per nine innings (9.75) and hits allowed per nine innings (5.759), second in ERA (2.19) and Adjusted ERA+ (176), and third in WAR (6.3). Fernández won the Sporting News Rookie of the Year Award and the National League Rookie of the Year Award. He came in third place in the Cy Young Award voting behind Adam Wainwright and winner Clayton Kershaw. Fernández started his sophomore campaign as the Opening Day starter for the Marlins, making him the youngest Opening Day starting pitcher since Dwight Gooden in 1986. Fernández recorded nine strikeouts while walking none, and he joined Bob Gibson, Steve Carlton, Ferguson Jenkins, Walter Johnson, and Cy Young as the only pitchers to do so on Opening Day. On May 12, Fernández was placed on the 15-day disabled list due to a right elbow sprain. An MRI revealed that the elbow had a torn ulnar collateral ligament, which prematurely ended Fernández's 2014 season. He underwent Tommy John surgery on May 16. He made eight starts, going 4–2 with a 2.44 ERA and 70 strikeouts in 2014. Fernández began the 2015 season on the 15-day disabled list but was later moved to the 60-day disabled list to continue recovery from Tommy John surgery. It was announced by the Marlins on June 15 that he would make his season debut on July 2. In his debut, Fernández recorded six strikeouts in six innings. He also hit a home run. Fernández returned to the disabled list in August with a biceps strain in his pitching arm. He returned to the mound in September and set a major league record for consecutive wins at home by a single pitcher with his seventeenth such win on the 25th of that month. To aid his recovery from Tommy John surgery, Fernández cut back on the use of his fastball during spring training in 2016 and began working on his secondary pitches. 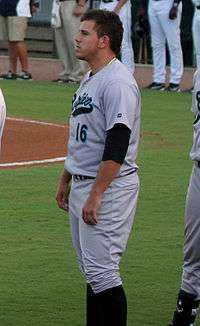 Appearing as a pinch hitter in the 12th inning against the Atlanta Braves on July 1, Fernández doubled in two runs to put the Marlins ahead 7–5, which ended up being the final score. He became just the second pitcher in Marlins history to produce a game-winning hit, following Dennis Cook on August 1, 1997. Fernández appeared in the 2016 MLB All-Star Game. Fernández's last game was on September 20. He pitched eight shutout innings in a 1–0 win against the division-leading Nationals, striking out 12 batters and allowing just three hits with no walks. Afterward, Fernández told a teammate it was "the best game he ever pitched", Marlins infielder Martín Prado later recalled. He finished 2016 with a MLB-leading 12.5 strikeouts per nine innings, and a new Marlins' season record of 253 strikeouts, in 182 1⁄3 innings. He won 16 games, the best of his four-year career, while losing eight, with a 2.86 ERA. For his career he had a 38–17 win-loss record for a .691 winning percentage and a 2.58 ERA. Fernández threw four pitches: a four-seam fastball that averaged 94–97 miles per hour (151–156 km/h) and touched 101 miles per hour (163 km/h), a slurve at 80–86 miles per hour (129–138 km/h), a changeup at 85–88 miles per hour (137–142 km/h), and a sinker at 88–94 miles per hour (142–151 km/h). Fernández considered his grandmother, Olga, the "love of his life". After six years apart, Olga and José were reunited in Miami after the 2013 baseball season. On April 24, 2015, Fernández became a citizen of the United States. Fernández announced that his girlfriend was pregnant with their first child on September 20, 2016. Early on the morning of September 25, 2016, Fernández was killed in a boating accident off Miami Beach, Florida, that also killed two others. The U.S. Coast Guard found the boat, Kaught Looking, at about 3:00 a.m., overturned on a jetty near Government Cut and South Pointe Park, and found three victims. A Florida Wildlife Commission official confirmed that Fernández had not been driving the boat, and also that he had been killed from the impact of the crash. The commission received a toxicology report from the medical examiner of Miami-Dade County, but opted not to release the results. The Marlins canceled their game against the Atlanta Braves that day. Teams around the major leagues honored Fernández after his death, paying tribute with a league-wide moment of silence and the display of his jersey. The Miami Dolphins also observed a moment of silence before their Sunday game against the Cleveland Browns. The next day, the Marlins announced that they would retire Fernández's uniform number, No. 16, in his honor, and all players wore his jersey for the final time for Monday's game, a 7-3 win over the New York Mets. The city of Miami and the Marlins held a public memorial and funeral procession for Fernández on September 28. His ashes were scattered in the sea on October 2. In a search warrant affidavit, Miami-Dade County authorities stated that a strong odor of alcohol was found on Fernández and the two other men in the boat. Also, it states that investigators allegedly found evidence that the boat's driver was speeding and driving with "recklessness" that was "exacerbated by the consumption of alcohol". Additionally, cocaine and twice the legal limit of alcohol were found in Fernández's system at the time of his death. ↑ "Diaz's homer helps Cardinals beat Marlins and Fernández, 5–4". ESPN. Associated Press. July 28, 2016. Retrieved July 29, 2016. ↑ Healy, Tim (July 28, 2016). "Jose Fernandez falters as Aledmys Diaz, Cardinals beat Marlins, 5–4". Sun-Sentinel. Retrieved July 29, 2016. ↑ Goold, Derrick (July 28, 2016). "Against boyhood friend, Diaz homers to send Cards to 3–0 lead". St. Louis Post-Dispatch. Retrieved July 28, 2016. ↑ McCarthy, Charlie (January 17, 2013). "Jose Fernandez set to make MLB debut Sunday". Fox Sports Florida. Retrieved April 6, 2013. ↑ Passan, Jeff (September 25, 2016). "Jose Fernandez: The American Dream". Yahoo! Sports. Retrieved September 25, 2016. ↑ Rodriguez, Juan C. (April 2, 2013). 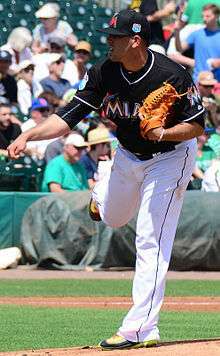 "Miami Marlins: Top prospect Jose Fernandez credits personal pitching coach Orlando Chinea for speedy ascent to majors". Sun Sentinel. Retrieved April 5, 2013. 1 2 3 "Florida high school sports | Former Alonso P Jose Fernández anchors minor league no-hitter". Tampa Bay Times. April 24, 2012. Retrieved April 5, 2013. 1 2 3 "Marlins reach deal with top Draft pick Jose Fernandez". Major League Baseball. August 15, 2011. Retrieved April 6, 2013. ↑ Fay, John (July 12, 2015). "Reds were on the trail of Marlins' Fernandez". The Cincinnati Enquirer. Retrieved July 13, 2015. 1 2 Maun, Tyler (September 25, 2016). "Fernandez stood out in brief Minors career: Marlins' 2011 first-round pick remembered as 'truly one of a kind'". MiLB.com. Retrieved September 25, 2016. ↑ "Miami Marlins sending two prospects to All-Star Futures Game". Major League Baseball. June 29, 2012. Retrieved April 6, 2013. ↑ Mayo, Jonathan (March 12, 2013). "Prospects pack rosters for 2012 All-Star Futures Game". MLB.com. Retrieved April 5, 2013. ↑ Rodriguez, Juan C. (September 29, 2012). "Marlins recognize top minor leaguers Yelich, Fernandez". Sun Sentinel. Retrieved April 5, 2013. ↑ Bailey, James (December 12, 2012). "Marlins top 2013 prospects". Baseball America. Retrieved April 5, 2013. ↑ "2013 Top 100 Prospects". Baseball America. February 19, 2013. Retrieved April 5, 2013. ↑ "Top Marlins prospect Jose Fernandez added to roster". USA Today. March 31, 2013. Retrieved April 5, 2013. ↑ "Sources: Marlins owner Jeffrey Loria personally mandated pitching lineup change". Yahoo!. Archived from the original on September 14, 2013. Retrieved September 10, 2013. ↑ Spencer, Clark (April 1, 2013). "WASHINGTON: In shocker, 20-year-old pitcher Jose Fernandez makes Miami Marlins starting rotation". Bradenton Herald. Archived from the original on April 3, 2015. Retrieved April 6, 2013. ↑ "2013 National League Awards, All-Stars, & More Leaders | Baseball-Reference.com". Baseball-Reference.com. ↑ "Jose Fernandez set to make MLB debut Sunday". Fox Sports Florida. January 17, 2013. Retrieved April 6, 2013. ↑ Rodriguez, Juan C. (April 7, 2013). "New York Mets walk-off Miami Marlins, deny Jose Fernandez win in stellar MLB debut". Sun-Sentinel. Retrieved April 10, 2013. ↑ Spencer, Clark (April 14, 2013). "Rookie Jose Fernandez dazzles in Miami Marlins' win over Phillies". The Miami Herald. Retrieved April 15, 2013. ↑ Mooney, Roger (September 25, 2016). "Jose Fernandez, Marlins ace and Alonso grad, dies in boating accident". Tampa Bay Times. Retrieved September 25, 2016. ↑ "Miami Marlins' Jose Fernandez shines at MLB All-Star Game". The Miami Herald. July 17, 2013. Retrieved September 2, 2013. ↑ Neal, David J. (July 29, 2013). "Jose Fernandez strikes out 13 as Marlins take series from Pirates". The Miami Herald. Retrieved August 3, 2013. ↑ Lemire, Joe (August 3, 2013). "A young Jose Fernandez continues to make history in fanning 14 Cleveland Indians". Sports Illustrated. Retrieved August 3, 2013. ↑ "Fernandez named NL Rookie of the Month". Major League Baseball. August 5, 2013. Retrieved August 13, 2013. ↑ "Marlins Jose Fernandez voted National League Rookie of the Month for August". Major League Baseball. September 4, 2013. Retrieved September 11, 2013. ↑ "Fernandez's year might be best by rookie pitcher". Major League Baseball. September 11, 2013. Retrieved September 11, 2013. ↑ "Jose Fernandez's Historically Great Season". SB Nation. September 1, 2013. Retrieved September 2, 2013. ↑ "Jose Fernandez Statistics by Baseball-Reference". Baseball-Reference. Retrieved September 11, 2013. ↑ "Jose Fernandez is Having a Historic Season". Field Rush. August 2013. Retrieved September 2, 2013. ↑ "National League Leaderboards » 2013 » Starters » Dashboard". FanGraphs. September 2, 2013. Retrieved September 2, 2013. ↑ "2013 National League Pitching Leaders". Baseball-Reference. Retrieved September 11, 2013. ↑ Spencer, Clark. "Miami Marlins' Jose Fernandez named Sporting News NL Rookie of Year – Miami Marlins". The Miami Herald. Retrieved November 14, 2013. ↑ Spencer, Clark (September 28, 2013). "ORLANDO: Miami Marlins' Jose Fernandez voted NL Rookie of the Year – Miami Marlins". The Miami Herald. Retrieved November 14, 2013. ↑ Rodriguez, Juan C. (November 13, 2013). "Jose Fernandez third in NL Cy Young voting". Sun Sentinel. Retrieved November 14, 2013. ↑ "Miami Marlins phenom pitcher Jose Fernandez to be front and center on Opening Night". The Miami Herald. March 31, 2014. Retrieved April 5, 2014. ↑ "Grandmother enjoys watching Marlins' Fernandez pitch, win". Associated Press. April 4, 2014. Retrieved April 5, 2014. ↑ Brown, David (May 12, 2014). "Marlins expect Jose Fernandez to have season-ending elbow surgery". Yahoo!. Archived from the original on May 13, 2014. Retrieved May 12, 2014. ↑ Spencer, Clark (May 13, 2014). "Miami Marlins ace Jose Fernandez to undergo Tommy John surgery, miss 2014 season". The Miami Herald. Retrieved July 9, 2015. ↑ "Jose Fernandez has Tommy John surgery on pitching elbow: Attorney for hurler says changed throwing motion led to injury". Canadian Broadcasting Corporation. Associated Press. May 16, 2014. Retrieved September 25, 2016. ↑ "Miami Marlins – TeamReport". Reuters. June 2, 2015. Retrieved March 9, 2016. ↑ Davis, Craig (June 15, 2015). "Fernandez targets return for July 2 vs. Giants". Sun Sentinel. Retrieved March 9, 2016. ↑ Frisaro, Joe (July 2, 2015). "Welcome back, back, back ... Jose Fernandez!". Major League Baseball. Retrieved March 9, 2016. ↑ Frisaro, Joe (August 11, 2015). "Fernandez (biceps strain) to DL; no structural damage". Major League Baseball. Retrieved March 9, 2016. ↑ Spencer, Clark (September 25, 2015). "Jose Fernandez struggles but sets unbeaten home record as Marlins top Braves 12–11". The Miami Herald. Retrieved March 9, 2016. ↑ "Jose Fernandez 1st to win first 17 home decisions as Marlins beat Braves". ESPN. Associated Press. September 25, 2015. Retrieved September 26, 2015. ↑ Spencer, Clark (March 7, 2016). "New mind-set for Miami Marlins' Jose Fernandez". The Miami Herald. Retrieved March 9, 2016. ↑ Davis, Craig (July 2, 2016). "Jose Fernandez pinch hits, gets winning hit for Marlins in 12th". Sun-Sentinel. Retrieved July 2, 2016. ↑ Fernandez, Andre C. (July 12, 2016). "Fernandez's moment with Ortiz, Ozuna's hit highlight Marlins' All-Star Game experience". The Miami Herald. Retrieved September 25, 2016. ↑ "Prado: Fernandez Told Teammate His Last Game Was His "Best Ever"". CBS Miami. September 25, 2016. Retrieved September 26, 2016. ↑ "Jose Fernandez". Baseball-reference.com. Retrieved September 25, 2016. ↑ "Player Card: Jose Fernandez". brooksbaseball.net. Retrieved July 9, 2015. ↑ Le Batard, Dan (July 16, 2013). "Stars align for Miami Marlins' Jose Fernandez – Dan Le Batard". The Miami Herald. Retrieved November 14, 2013. ↑ "Marlins' Jose Fernandez has emotional reunion with grandmother". Major League Baseball. Retrieved November 14, 2013. ↑ Berg, Ted (July 16, 2013). "Jose Fernandez's reunion with his Cuban grandmother will make you cry". For The Win/USA Today. Retrieved November 14, 2013. ↑ "Marlins' Jose Fernandez Becomes U.S. Citizen". CBS Miami. April 24, 2015. Retrieved April 24, 2015. ↑ "Miami pitcher Jose Fernandez, from Cuba, becomes US citizen". ESPN. Associated Press. April 24, 2015. Retrieved April 24, 2015. 1 2 Grautski, Amara; Good, Dan; Rex Brown, Stephen (September 25, 2016). "Jose Fernandez, Marlins pitcher, killed in boating accident at 24 years old". Daily News. New York. Retrieved September 25, 2016. 1 2 "Jose Fernandez dies in boating accident". ESPN. September 25, 2016. Archived from the original on September 25, 2016. Retrieved September 25, 2016. ↑ Spencer, Clark; Neal, David J. (September 25, 2016). "Marlins pitcher Jose Fernandez killed in boating crash". The Miami Herald. Archived from the original on September 25, 2016. Retrieved September 25, 2016. ↑ Villa, Walter (September 25, 2016). "Official: Jose Fernandez died from crash impact, not drowning". USA Today. Retrieved September 25, 2016. ↑ Smiley, David (October 4, 2016). "Investigators keep Jose Fernandez toxicology results confidential". Miami Herald. Retrieved October 5, 2016. ↑ Anderson, R.J. (September 25, 2016). "LOOK: Here's how players paid respect to Jose Fernandez during MLB games: The baseball world continues to react to Jose Fernandez' passing". CBS Sports. Retrieved September 25, 2016. ↑ "Jose Fernandez dies in boating accident". ESPN. September 26, 2016. Retrieved September 26, 2016. ↑ Ducey, Kenny (September 26, 2016). "Marlins will retire No. 16 in honor of Jose Fernandez". Sports Illustrated. Retrieved September 26, 2016. ↑ Joseph, Andrew (September 28, 2016). "Marlins players surrounded Jose Fernandez's hearse in a moving tribute". USA Today. Retrieved September 28, 2016. ↑ Werner, Barry (October 4, 2016). "Jose Fernandez's ashes scattered at sea". Fox Sports. Retrieved October 5, 2016. ↑ "Report: Alcohol factored in Fernandez boat crash". ESPN.com. Retrieved 2016-10-27. ↑ "Toxicology report shows Jose Fernandez drunk, used cocaine". ESPN.com. Retrieved 2016-10-29. ↑ "Marlins star Jose Fernandez was legally drunk, had cocaine in blood when he died, medical examiner says". Retrieved November 4, 2016. Wikimedia Commons has media related to José Fernández.